A method, using microporous membrane liquid-liquid extraction technique (MMLLE) and gas chromatography with an electron capture detector (GC-ECD) and gas chromatograph coupled to a mass spectrometer, was developed for the analysis of cyclic organochlorine pesticides (OCPs) and polychlorinated biphenyls (PCBs) in sediment slurry. The MMLLE extraction employed isooctane as the organic liquid that was immobilised in the hollow fibre pores and in the lumen, at optimal sample pH value of 2.0 for OCPs and 7 for PCBs. The effect of triton x-100, in enhancing the dissolution of the compounds from sediment, was found to be optimal at a value of 0.15%, while the ionic strength was optimal at a value of 0.01 M. Samples from coastlines along the Indian Ocean in the southern parts of South Africa were found to be contaminated with cis and trans chlordane at concentrations of up to 0.003 mg/kg, while samples from northern parts were contaminated with 2,2',4',4-tetrachloro-1,1'biphenyl at concentrations of up to 0.02 mg/kg. Persistent organic pollutants, for example, organochlorine pesticides (OCPs) and polychlorinated biphenyls (PCBs), are used worldwide for many purposes, including the control of plant diseases and disease vectors (Sanchez et al., 2006). However, they pose a significant toxicity problem due to their low volatility and slow degradation once exposed to the environment, causing high persistence (Hong et al., 1999; Tanabe et al., 1997). Organochlorine pesticides tend to be persistent in the environment because the presence of chlorine in an organic molecule reduces reactivity towards oxidation, and, being of low solubility in water; they are resistant to hydrolysis (Hong et al., 1999; Tanabe et al., 1997; Safe, 1990). These persistent organic pollutants have a tendency to concentrate in fatty tissues and bio-accumulate in the food chain due to their high hydrophobicity (Chen et al., 2002). This bio-magnification tendency of OCPs is responsible for their occurrence at higher concentrations in organisms of higher trophic levels in food chains. Polychlorinated biphenyls are also suspected to be carcinogens. In South Africa, the presence of agrochemical residues in the environment represents a serious and urgent challenge (London, 1992; 1995; Dalvie et al., 1999; Hassett et al., 1987; Grobler, 1994), because of the large diffusion potential of the agrochemical residues in the environment and their particular chemical characteristics and properties which determine their persistence and toxicities in waters and soils. This makes the development of sensitive and selective analytical methods crucial, not only for the detection of the presence of these persistent organic pollutants and their degradation products, but also to study their distribution across the environmental compartments. Importantly, this will enable the establishment of the exact bio-available fraction for each pollutant in a given environment. However, many of the known analytical procedures are designed to give a measure of the total contamination levels due to agrochemical residues, while the actual amounts available for absorption into the biological system may be lower, due to the interaction of each compound with the matrix molecules. Furthermore, bioavailability is dependent on the nature and properties of the chemical species polluting the environment, and the type of matrix in which pollutants are found (Dean and Scott, 2004). 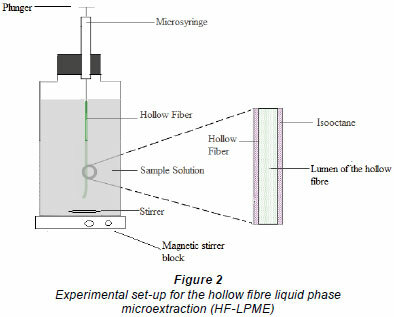 In this work we have employed liquid phase micro-extraction using HF-LPME, commonly known as hollow fibre microporous membrane liquid-liquid extraction (HF-MMLLE) in GC-ECD, in order to study and determine the easily bio-available fraction of contaminants. Further confirmation of peaks by gas chromatography coupled to a mass spectrometer operating under electron ionization (GC-EI-MS) was done. Hollow fibre microporous membrane liquid-liquid extraction is a technique based on 2 phases (aqueous-organic): the donor phase (the aqueous sample to be extracted) and the membrane phase (an organic liquid held in the pores of a hydrophobic polymer). The extraction protocol essentially consists of 1 step, i.e., extraction of the analyte from the sample phase using an organic solvent (Pedersen-Bjergaard and Rasmussen, 1999). 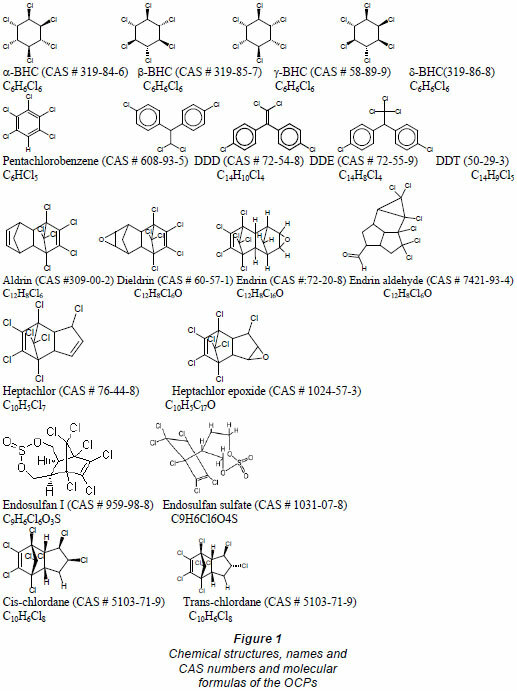 Organochlorine pesticides and PCB standards (> 99% purity) (Fig. 1; Table 1), were purchased from Riedel-de-Haën (Seelze-Hannover, Germany). Pesticide-quality solvents (n-hexane and toluene) and calcium chloride were purchased from Panreac (Barcelona, Spain). Sodium hydroxide pellets (98%) were obtained from Saarchem (Krugerdorp, Africa). Stock standard solutions of individual compounds (with concentrations of 1 000 mg/ℓ) were prepared, while triton x-100 and hydrochloric acid were purchased from N.T. Laboratory Supplies, (Johannesburg, South Africa). A multicompound working standard solution (1 µg/mℓ concentration for each compound) was prepared by appropriate dilutions of the stock solutions (1 000 mg/ℓ) with hexane:toluene (1:1) and stored under refrigeration (4ºC). Samples were collected from several points along the northern Indian Ocean coastline of South Africa (along the Durban Harbour) and from the southern Indian Ocean coastlines, near East London. Surface sediment samples were collected with a clean stainless steel Van Veen grab. The first 5-10 cm sediment layer were scraped off into a stainless steel mixing bowl, and thoroughly mixed using a stainless steel spatula. The homogenized sample was then transferred into a rinsed solvent bowl (first with hexane and then with dichloromethane). Sediment samples were kept frozen until analysis was done. These samples were then air dried and sieved through a < 2 mm metal sieve in order to remove the coarser fractions. After drying, the samples were ground first with a mortar and pestle, before using a stainless steel blender, resulting in a fine powder. Sediment samples were collected, dried and ground to make homogeneous fine particles. The finely ground sediment samples were then mixed with 0.01 M CaCl2 (1/40 (w/v)). To enhance dissolution of PCBs and OCPs, a non-ionic surfactant, triton x-100 (0.125%) was incorporated. The resulting solution was then extracted using the HF-LPME method. The hollow fibre tube used in this study was Q3/2 Accurel polypropylene hollow fibre membrane (200 µm wall thickness, 600 µm inner diameter, 0.2 µm pore size) obtained from Membrana GmbH (Wuppertal, Germany). The hollow fibres were impregnated with isooctane for about 5 s to open membrane pores and then immersed into 10 mℓ of sample which was subjected to stirring. The 100 mℓ syringes were used to support the hollow fibre during the extraction process, which proceeded for 30 min (see Fig. 2). When the extraction was complete, the syringe plunger was then depressed, flushing out the extracts from the lumen of the hollow fibre into a 100 mℓ insert fixed inside 1.5 mℓ sample vials. The Perkin Elmer GC system equipped with a manually-operated ECD detector (Valnut Creek, CA, USA), as well as HP Agilent 6890 GC/5973 MS (Santa Clara, CA 95051 USA) were both used for the analysis of organochlorine pesticides. The column, DB-5 (30 m × 0.25 mm i.d. × 0.25 µm film thickness) from Supelco (Bellefonte, PA, USA), was used in PE GC system and J&W HP5-MS (30 m x 250 µm diameter x 0.25 µm film thickness) was employed in the HP Agilent GC/5973 MS system. The flow rate of the carrier gas (nitrogen) was 1.5 mℓ/min and the injection volume was 0.5 mℓ. The glass liner was equipped with a plug of carbofrit (Resteck, Bellefonte, PA, USA). The mass spectrometer was operated under EI mode, Scan 35 to 500 amu, Source 230ºC, Quad 150ºC, and solvent delay 4 min. The quality assurance and method validation consisted of the analysis of blank samples, measurements of reproducibility and repeatability parameters, as well as the analysis of certified reference materials. The certified reference material (CRM-No. IAEA 417 for organochlorine compounds (OCPs & PCBs) and petroleum hydrocarbons in sediment samples (Analytical Quality Control Services, International Atomic Energy Agency, Vienna, Austria) was used to validate the analytical method. The results of PCBs congeners from the tests (an average of 1.03 ± 0.07 mg/kg) were in good agreement with the certified values. Similarly, the results of OCPs from the tests conducted were found to be in good agreement with the certified values with average relative deviations ranging between 1.4 and 16%. The recoveries for both PCBs and OCPs were in the range 72-91% for all compounds for the spiked samples. Several analytical parameters had to be optimised to enhance the extractability of OCPs and PCBs from sediment. Factors studied included: amount of triton x-100, ionic strength of the CaCl2, sample pH, extraction time and the type of organic solvent. The inclusion of triton x-100 was found to significantly enhance the dissolution of OCPs and PCBs from the sediment to the solution. As the percentage of triton x-100 was increased, more of the OCPs and PCBs were brought into the solution and hence increased extraction efficiency by the hollow fibre. The ionic strength of the CaCl2 solution was found to influence the dissolution of OCPs and PCBs. As the concentration was increased from 0.005 M to 1 M, the extraction efficiency was increased and an optimal was obtained at 0.01 M.
It is known that sample pH has an influence on the enrichment of analyte in the membrane extraction process. If the pH value of the sample is equal to, or slightly higher than, the pKa value of the analyte, the analyte molecules in the sample will be in ionic form. The ionic form would not be suitable for entrapment of analytes by the liquid membrane (Jönsson and Mathiasson, 1999a;b). In this work, the variation of sample pH with the analyte enrichment, as measured by the peak areas for sample solutions of 1 mℓ/kg, was investigated for both the matrices (slurries) in which PCBs and OCPs were contained. 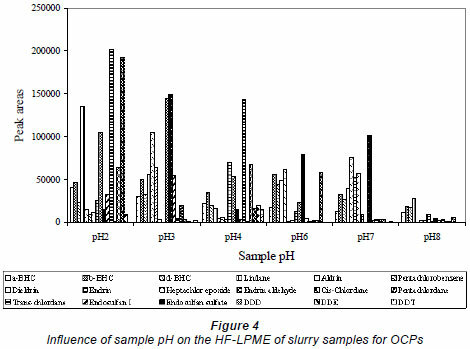 With OCP slurry, the sample pH was varied from pH 2 to pH 8, while for PCB slurry the sample pH was varied from pH 4 to pH 10. The results showed that the analyte enrichment of compounds increased with pH to different optimal pH values (Fig. 4); thus the enrichment was sample pH dependent. Figure 4 shows that most of the OCP slurries studied experienced higher enrichment at lower pH (2-4). These OCPs included, aldrin, cis chlordane, trans chlordane, dieldrin, endrin, DDD, DDE, and DDT. Others, like a-BHC, b-BHC, d-BHC, endrin and endrin aldehyde, experienced enrichment over an acidic pH and performed poorly at pH above neutral, which suggests that they are not stable at those pH ranges. The OCP slurry enrichment was found to drop drastically especially at alkaline pH values. With PCBs, most compounds were found to have highest enrichment at neutral pHs (data not shown). The optimal pH values chosen were therefore pH 2 for OCPs and pH 7 for PCBs. The composition of the organic liquid membrane is known to play an essential role in governing the extraction efficiency and selectivity of the analyte (Jönsson and Mathiasson, 1999a). For higher analyte enrichment, it is desired that the partition coefficient of the analyte should be as large as possible in comparison with interferents (Jönsson and Mathiasson, 1999b); it should have a low water solubility and the analytes to be extracted must be soluble in it. Therefore, 3 liquid membranes were tested in an attempt to identify suitable liquid membranes for the extraction of these compounds from the sediment slurry. These included: hexane (polarity index 0.1), toluene (polarity index 2.4) and isooctane (polarity index 0.1). Of these, isooctane was found to be the most suitable solvent (Fig. 3) as it extracted the majority of OCPs and PCBs at a relatively higher order than the other two solvents, which showed a tendency to evaporate faster while having a relatively slightly higher water solubility. The effect of extraction time was studied using a 1 mg/ℓ sample solution of a mixture of both OCPs and PCBs at constant stirring speed of 400 r/min. The results obtained showed that the effect of time was important and demonstrated that the enrichment of analyte was time dependent. At given conditions the enrichment was optimal at about 30 min. Beyond that time (30 min), the extraction efficiency started to decrease. Therefore 30 min was taken as the optimal extraction time for all the OCP and PCBs. To investigate linearity of the membrane extraction/enrichment process, blank samples were spiked with varying concentration of standards of OCPs and PCBs. The linearity of the membrane extraction method was then determined by injecting 1 mℓ standard solutions with concentrations ranging between 0.2-1 mℓ/kg of both OCPs and PCBs. The blank matrices as well as the spiked samples were also extracted at optimal conditions and determined by GC-ECD and GC-MS. Linear calibration graphs were constructed for average peak areas versus concentration. Good linearity was found in the concentration range studied, with determination coefficients higher than 0.99. 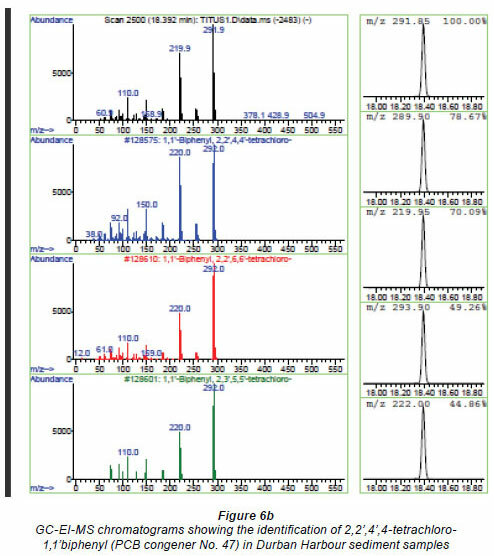 The gas chromatographic separation of the OCPs and PCBs was successfully achieved and the identification of the individual peaks was aided and validated by the MS for the environmental samples (Figs 5a-c for OCPs and Figs. 6a and b for PCBs). Analysis of sediment samples from southern and northern coastline areas in South Africa. The developed method was applied to samples that were collected from the southern and northern coastline areas of South Africa. 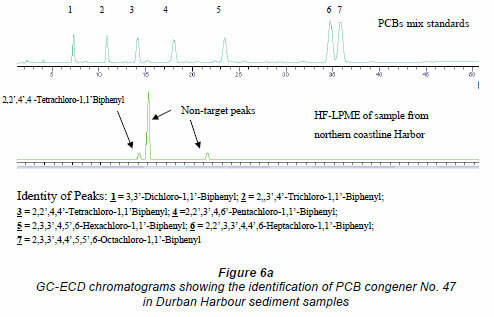 Two OCPs, namely, cis and trans chlordane, were detected from sediment samples in southern coastline areas near East London at concentrations of 0.003 mg/kg, and 1 PCB, 2,2',4',4 tetrachloro-1,1'biphenyl, was also detected from the sediment samples collected from the northern coastline near the Durban harbour area, at concentrations of 0.02 mg/kg. The OCPs might have emanated from either agriculture-related activities or fumigation activities in the neighbouring areas. The PCB contamination of the harbour may originate from the PCB-bearing oil and sediments that have accumulated in the structure over a period of time. The augmented PCB migration from the bedrock beneath may also have been responsible for the contamination. Another possible source of PCB contamination in harbours may be from painting of ships. The values obtained were lower than the threshold limits set by EPA, which is 2 mg/kg (FAO/WHO, 1986). The method developed involving HF-LPME, GC-ECD and GC-EI-MS was shown to be successful, working within a reduced time frame as compared to other methods, such as soxhlet extraction, which not only are longer and more tedious but extract the total and not merely the bio-available fraction of the contaminants. 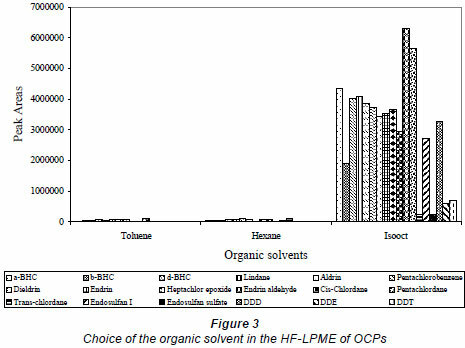 This method's attractive features, such as simplicity, the use of minimal organic solvents and high extraction efficiencies and enrichment factors, have added value to the analysis protocol of OCPs and PCBs in sediment slurry. Financial support from NRF-Swedish is gratefully appreciated. Received 8 July 2010; accepted in revised form 13 December 2010.